This is very delicious. Maybe I’ll try it someday. 8 years later I stumble on this… tried to make them and the outer ring tasted fantastic… but then I realised the inside wasn’t actually cooked (weirdly, the toothpick I inserted came out fine…?). but it’s super oozy… and greasy….? I’m not in the US, so I’m wondering if something is off with my ingredients… maybe the fat content of my butter? Hi Justina, It is 60%. In reference to the name…….aren’t all brownies baked? However I can relate to your opinion when it comes to reviews by “America’s Test Kitchen, especially tools in the kitchen… What they’ve demonstrated countless times is many companies NEVER did prototyping of their product they released on the market. There is NO way they could have had 10 or 20 people used and tested many of the products that sre sold. There is no way otherwise they would have fixed the problems. My family used to have a store for a while. We sold many things, including kitchen tools. I quickly came to appreciate the upset. 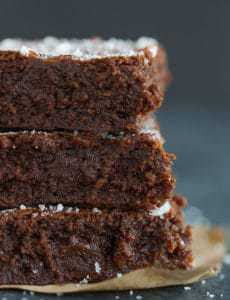 Hi Pamela, The name comes from the bakery where the brownie recipe originated – it is called simply “Baked”. 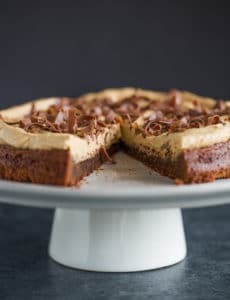 A close friend of mine loves this recipe, but is on a lowcarb diet. So, I’m trying to modify this to make her feel a little better about eating them. I plan to use coconut flour in a ~1/3: 1 ratio while decreasing the number of eggs to adhere to a 6:1 ratio I found on some online tutorials. I will post the final results and recipe later after the taste test. Hi! 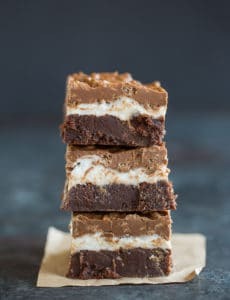 My mother in law wants a black forest brownie for her birthday…any ideas on adding to this recipe or the better than box? 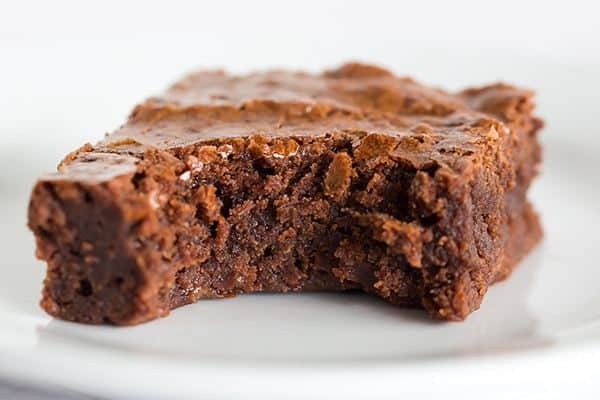 Hi Carolyn, I would use the better than box mix brownies – that’s my go-to recipe for doctored up brownies! Thank you…how would you incorporate the cherries? What type and amount? I have found so many variations! Syrups, jams, frozen, fresh…goodness! I am paring it with coffee ice cream and fudge sauce…she is a woman who knows what she wants! I love it! 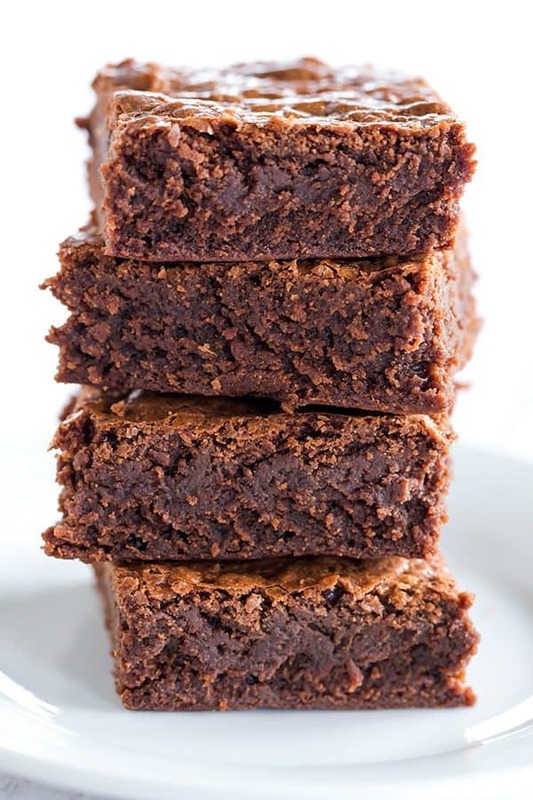 And by the way….have you ever heard of an 8 x 10 brownie pan? It is in a cookbook I have and I have never seen that….did searches and nothing came up except quarter sheets…but that just doesn’t seem deep enough. Hi Carolyn, I would do fresh, but they’re not in season right now, so frozen might work well too! I’ve never heard of an 8×10 pan, but I do know that Pyrex makes a 7×11! 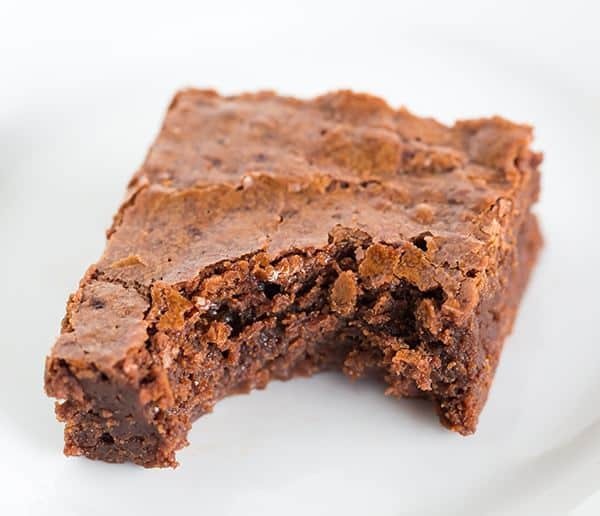 This is one of the first made from scratch brownie recipes I’ve tried that is absolutely worth the extra effort vs using a box mix. My bible study absolutely raved about them and fought over bringing the leftovers home!! Thanks so much for sharing. 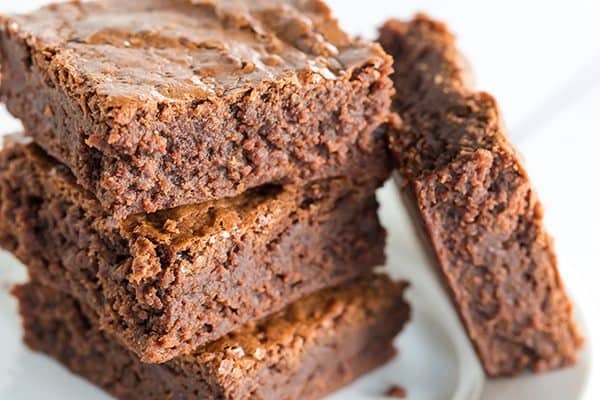 I have made these brownies several times and they are always fantastic! 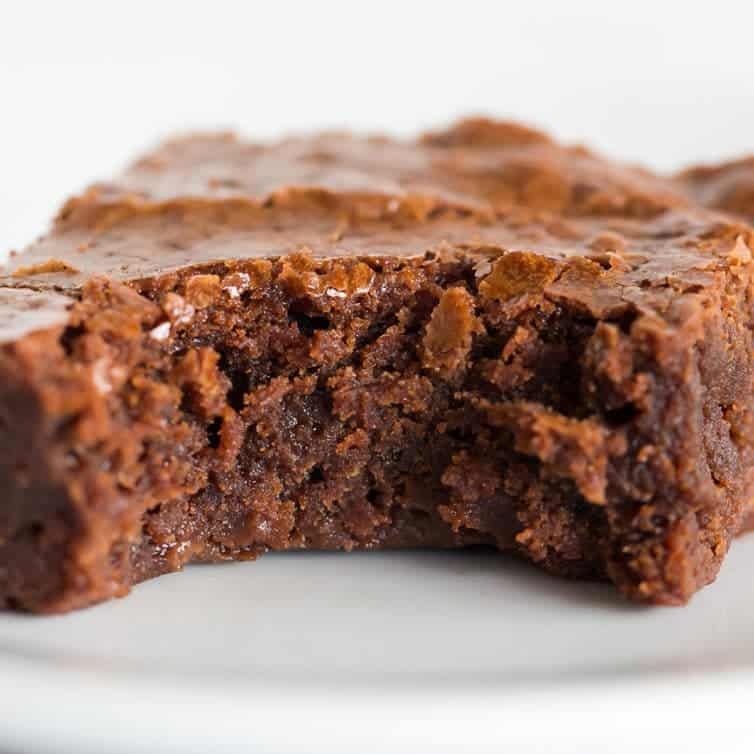 They are so rich and dense; the texture is moist and fudgy without being too ‘gooey.’ I will never go back to another brownie recipe again! I never wait for the chocolate mixture to cool to room temperature before adding the eggs and my brownies turn out just fine. These usually do end up taking up to 10 minutes longer to cook than the recipe says. This is now my go-to brownie recipe. Everything you promised and more ! I mean, you COULD… but you could also make the regular batch and freeze what you don’t need for another day! I made these and they are awesome! But my kids prefer the taste of milk chocolate. Is it an equal substitute to put in milk chocolate? Have a blessed day! Hi Brianne, I think if you used milk chocolate these would be way, way too sweet. I’d try stepping down to semisweet chocolate first. Oh my goodness these are amazing. I have always been a boxed brownie believer, but these have changed my mind. Chocolately and moist with that signature crackly top–they’ve got it all! Thanks for the recipe! I’m honestly not sure how it would affect the flavor and texture. Hi AJ, Are you talking about step #3? They don’t need to melt, you just need to whisk to thoroughly combine them. I made these and wow, they’re fabulous. So fudgy and rich tasting. I added chopped walnuts and it brought them to another level. Definitely will keep this recipe. Great recipes and I also like that your ads are about helping Animals! I have made your Irish Soda Bread and that cane out really well. Thanks so much for sharing the photos of the finished recipe and of your men in short pants! Just made these for dessert after dinner tonight – they were perfect! Even better with vanilla ice cream on top. ? These are not super sweet. Would make again! I made these for a treat for the teachers at my daughters school and they absolutely loved them! Recipe was easy to follow and the results were spectacular! Thanks for another great recipe.